The U.S. fintech ecosystem continues to grow quickly. But broadly speaking, it is still early innings for consumer adoption of digital banking and financial services. According to the most recent Federal Reserve statistics, only 38 percent of U.S. banking customers used mobile banking in the past year—often for narrow uses such as checking an account balance. A 2015 Ernst & Young survey found that one in six U.S. adults uses a fintech product such as Mint or Venmo. This is solid traction, to be sure—but hardly as ubiquitous as, say, ATMs. In other words, banks remain the hub of most consumers’ financial lives—even as consumers gradually use more financial apps and software. This dynamic naturally creates questions—and opportunities—around how banks can best collaborate with customers and fintech firms, especially as personal financial data flows to third parties. To inform this view, Plaid commissioned a survey of 848 U.S. consumers who use financial applications or software. The survey found that despite steady fintech growth and media reports of disruption, consumers are looking to banks to help them manage their digital financial services. And no wonder: For most consumers, fintech products are mere extensions of the banking bedrock. Traditional financial institutions still hold the overwhelming majority of liquid assets outside of investment accounts. They also provide most core financial services. Online-focused lenders, for example, originate less than one-tenth of U.S. home mortgages, and in verticals like payments, digital players have hardly made a dent in overall transaction volume. Viewed in this context, then, it is perhaps not surprising that consumers want banks to anchor and enable their digital financial lives. This enablement could take different forms. 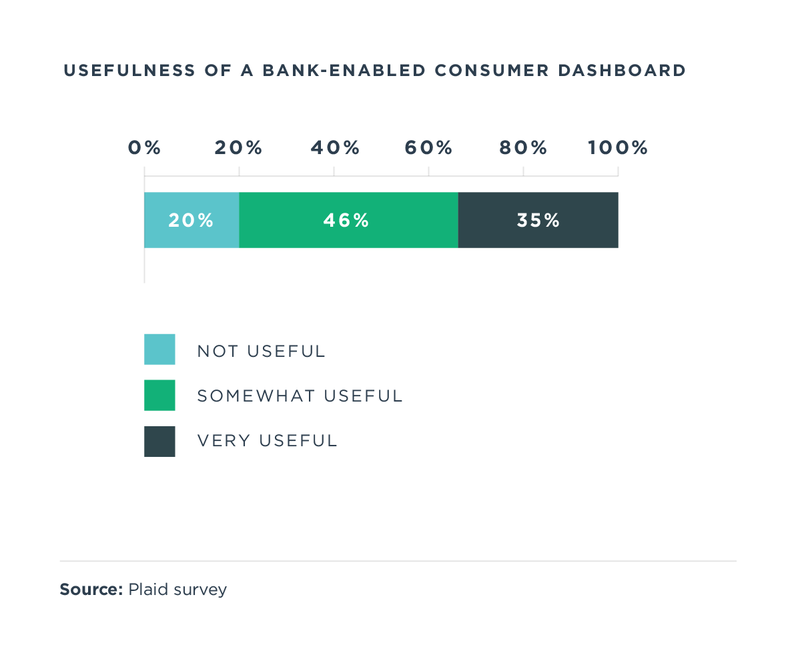 For example, 80 percent of consumers indicated that they would like banks to enable a dashboard for them to track and manage financial apps. This dashboard would allow consumers to see which apps are using their bank data, and to change which apps can use their data directly from the bank website or app. Banks have yet to embrace this role—creating an unmet opportunity to help consumers manage their relationships with various fintech players. The survey also suggests that banks need to strike a careful balance between empowering their customers and limiting choice. Data access allows customers to more deeply interact with a variety of financial services—including their banks. Conversely, hindering data access—whether through a clunky user experience, or charging for it—may undermine a bank’s relationship with its customers. 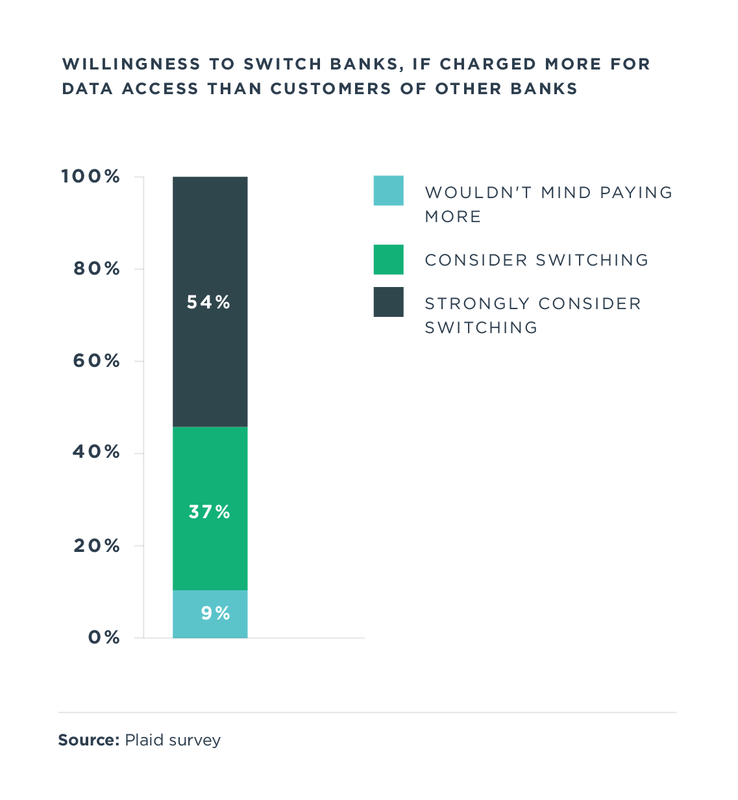 Despite the high value that consumers place on data access, 82 percent said they would be likely or certain to not pay for it. Further, 91 percent of consumers reported that they would consider switching banks if charged more to use an app than customers of other banks. What’s more, among the small group of consumers who would consider paying for third-party data access, there is limited appetite to splurge. Forty-three percent of this group would pay less than $1 per month, while an additional 30 percent would only pay up to $3. As financial services become increasingly digital and distributed, the boundary between banking and third-party apps will become more fluid. Banks that embrace change—creating tools to actively manage this boundary—will be positioned to further deepen customer relationships. Together, consumers, banks and third-party fintech providers can create a bank-anchored, 21st-century financial ecosystem with secure and empowered consumers. About this survey: Plaid used an established external survey vendor to profile 848 US consumers ages 18-54 who reported using a financial app or software within the past six months. Respondents are representative of the overall U.S. population that meets these criteria.